You have had an actioned packed start to your learning year in room 6 and Team Pango. Every morning you come into class with a smile on your face greet us all, you have lovely manners and are a kind and caring friend. 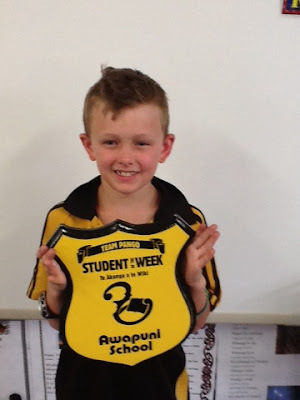 You demonstrate the qualities that make an Awapuni Super Kid along with being a role model in Team Pango. You are working hard on developing a real give it a go attitude when trying new things and this was evident in the successful Pango in Pyjamas sleepover and marine reserve visit. We were all so proud of how you joined in the fun and achieved a new goal. Jack you take pride in your school work striving to present quality and I can see you challenging your own thinking especially around our integrated study this term. Keep up this great learning journey and continue to give new things a go.